A letter from MonroviaNow reader Anna Marie Hetman. I noticed your compliment in MonroviaNow ( http://goo.gl/E8aSEM ) regarding the flamingos and lights on North Alta Vista. I'd like to tell "the rest of the story", stealing a line from Paul Harvey, so you have the background. Several years ago my husband, Tom Hetman, and I returned from seeing the lights at Hastings Ranch. Tom was telling our neighbor, Tony Hunt, about the light displays on various streets. Tony suggested we should do a street theme. As the two of them discussed it Tony came up with the idea of pink flamingos with Santa hats. Why? Because no one else has done it. Tom had a friend at work make a prototype that Tony painted. Unfortunately before being able to present the idea to the neighbors Tony developed cancer, and after giving it his best he passed away the summer of 2003. Every year Tom put up that flamingo in Tony's honor. A couple of years ago when we had the high winds our flamingo took flight. We surmise it broke into pieces and the city crew must have picked it up with the debris. As autumn of 2013 came Tom started wondering about what we were going to do without a flamingo in honor of Tony. Tom decided it was time, ten years after Tony's passing, to make his idea come to life. He talked with our neighbor, Sherm Jaffee. Sherm, who does a lot of wood work, drew out and painted a flamingo. We invited our neighbors over one Saturday morning and presented the idea. We were not expecting the enthusiastic response that was shown. We were also not prepared for how it touched Tony's wife, Carol, and daughters, Chris and Heather. The flamingo had to come from the same template and be pink; otherwise it was open to each family's creativity. If you take the time to look at each flamingo they are unique. Neighbor, Nancy Matthews, really built up momentum with her encouragement and ideas. Some neighbors had painting parties. Occasionally we would see a neighbor carrying the template to another neighbor to cut out. It was fun to watch each individual flamingo go up. Tom and I were out of state for a couple of weeks, and Nancy sent reports as to how many had gone up. When we arrived home and saw the lit up flamingos it was truly amazing to see Tony's idea come to life. The night of judging the neighbors came over, brought food and drink while we awaited the judges arrival. Nancy and Cindy had the idea of luminaries to tie the street together. Along with some of the neighbors we must have had over a hundred luminaries lining the street when the judges came. One of the lovely things we experienced as a result of Tony's flamingos was getting to know neighbors better. Although this has always been a great neighborhood, with wonderful neighbors, it definitely brought us together with a common activity. And now, the flamingos are spreading. 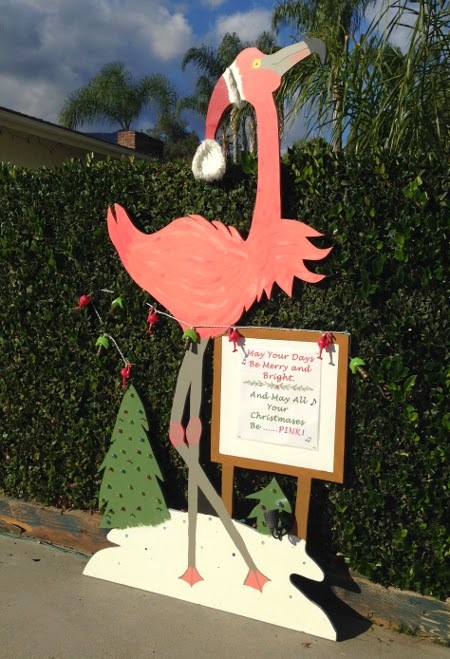 Several neighbors between Foothill and Hillcrest are sporting their own unique take on Tony's flamingos. You probably are wondering why Tom felt it was necessary to make the flamingos happen in honor of Tony. Well, there are many stories to tell about Tony, but probably bottom line was his role as a homeowner mentor to Tom. Whenever there was a question Tony was right there to help. Tony truly epitomized what it was to be a neighbor. Now, many neighbors did not know Tony, but it was only right that his being a "neighbor" should blossom into the neighborliness this project has developed. Thank you for letting me tell you about Tony's flamingos. This story brought me to tears. Thank you so much for sharing this! I can't wait to take a drive there with my husband and take it all in. Such a sweet and amazing set of neighbors. I didn't know Tony, but I know he must be smiling ear to ear at the sight of this comradery and infectious spirit. Tony was my brother and I just read this article yesterday and spent half the day crying. I miss him and am so proud that you actually honor the brother that I loved so very much. Next year I'll drive from May Ave to Alta Vista and look at his old neighborhood (from the pictures it looked awesome).